Misleading record titles at its finest! This one is not the blues, nor is it exactly Cuban in musical structure, but that’s okay since it’s also not Eddie Williams, the bass player of this aggregation, who is the one taking front and center on the recording which features his name as the primary artist either. Instead it’s pianist and singer Floyd Dixon who is the focal point, making this one trip where the map you’ve been given by the record label would be of no help at all. Luckily you have us to help chart your course. We’ve already gone into the back stories of both Dixon, in the review for That’ll Get It, his first release as a rock artist after a previous chart hit with his debut with a blues song, and of Williams the long-standing bass player for the cocktail blues stalwarts Johnny Moore’s Three Blazers, on the flip side of this, Houston Jump. So recapping their twisted roads to this point in their working relationship is probably unnecessary. Suffice it to say that this was somewhat of a temporary diversion for Williams who would soon go back to the realm in which he found his most acclaim, sticking with Moore as new lead singers filed in (and filed out again) after the departure of the incomparable Charles Brown from that outfit who himself was currently enjoying a massive hit after going solo (with Williams on bass for his old bandmate no less!). But while he got the opportunity Williams seemed bound and determined to branch out musically and explore the rock field with his uncomfortably named “Brown Buddies” group. As for Dixon his time within any group was destined to be relatively short-lived since his concurrently recorded solo efforts (for a different label no less) proved equally fruitful and after just under a year with these guys he realized it was far better to be the headlining attraction on your own hits than the uncredited singer on someone else’s efforts. But their time together was never less than interesting and with Blues In Cuba they show their gift for creativity right off the bat on the flip of their first release. What jumps out at you right away is the intoxicating rhythmic pattern displayed throughout Blues In Cuba. It has a somewhat ragged appearance at first but the textures the individual parts offer as they weave in and out of one another’s path makes for an absolutely mesmerizing arrangement that will stick in your head for a long time. The pace is positioned just past the point of crawling, yet not quite energetic enough to be called even medium tempo, though that’s what it is. It kicks off with a slamming drum before the others join in and pull you under their sway. Once you’ve given yourself over to the pull of their inventive arrangement Dixon’s voice comes in, adding the right amount of character to this heady brew. 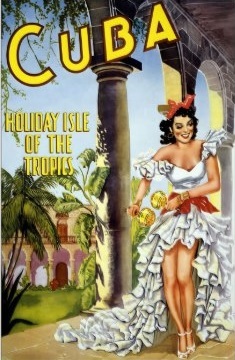 He’s called upon to affect a rather crude, somewhat offensive yet not meaning to be, generic “island accent” as he tells his current girl that he’s leaving her to go back to Cuba (ostensibly where he is from, though he never says for sure but it’s certainly implied), because the one he’s dumping here on the mainland causes him too much grief. That’s all there is to it really, there’s two verses and no depth, no backstory as to what his present girlfriend has done to draw his ire, and no reaction offered by the girl in question to either protest his decision or to tell him off, hoping the boat he’s taking sinks and drowns him in the Caribbean Ocean. It’s almost to the point of being just a rough sketch of a song that’s yet to be filled in, but it’s never so bare bones in construction as to be simplistic. There’s an ambience here that is the primary focus, something the minimal lyrics actually add to by their brevity, and in spite of the sparse nature of the record’s actual content it is still very captivating, putting you in a hypnotic trance. Dixon would cut this a few years later as a solo act (which we’ll cover in due time, don’t worry) which is the more well-known performance of the song…. well, probably not “well known” in any real sense of the term to modern listeners, so let’s just say “more easily found” (the easiest way to tell which is which is the Williams version comes in at 2:25 compared to 2:42 for Floyd’s later take on it). On Dixon’s subsequent solo version he has a deeper tone than he displays here, slightly more melodic too. But here Dixon, sounding every bit as young as his twenty years, still holds your full attention with his mysterious manner that seems to imply all sorts of underhanded dealings going on under the surface. Good luck figuring out what they might be however, as he doesn’t even offer a hint to suggest what the girl he’s leaving behind has done to him, nor does he offer any possibilities of what the girl he’s headed to see brings to the table herself that makes her the better catch. Truth be told I’m of the opinion he’s making her up to try and get his American sweetheart to change her ways and treat him better. Of course if that is indeed the case we all can guess how THAT will turn out, as she’ll see through his bluff and even if they do manage to stay together she’ll make him suffer for his duplicity because it’s obvious he’s the inexperienced novice in this relationship despite the front he’s trying to put on for his sake and for ours. The real stars of this though are the band. For as well as Dixon comes across singing the same scant number of words you might find on a fortune cookie, the musicians are busy picking up the slack by injecting every inch of wax with a contrasting rhythmic pattern that should come with a 90 proof label, that’s how intoxicating it seems. Again, much like with the lyrics simplicity is the secret ingredient of the formula. 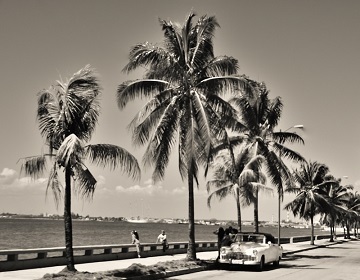 Blues In Cuba is hardly predictable at any rate, an unusual attempt at creating a visual scene by merely hinting at things your imagination will be called upon to flesh out. Ellis Walsh has the most responsibility, his crackling drums playing the shimmying pattern that holds this together as he alternates moments of emphasis with instances where he eases back and allows you to catch your breath before leaping back to the forefront again. This is the kind of thing that draws attention yet isn’t done to show off his skills as much as it’s used to keep the listener on edge, as otherwise the intentionally lagging vocals might cause you to lose focus. With Walsh manning the kit there’s no chance of that. Chiming in with two hypnotic descending lines repeated ad nauseum throughout the main structure of the song is Tiny Webb’s guitar. Combined with the other instruments their interwoven textures exert an even stronger pull, but it’s Webb who gets the first chance to step outside that small box with his solo coming a minute into the proceedings which is particularly captivating. He never falls into predictability either, mixing things up as he goes, adding twists and turns, alternately bearing down and easing off with a light touch over the surprisingly long forty second spot which despite its length never overstays its welcome. Though we’ve seen more guitar being utilized in rock as of late Webb shows he can hang with the best of them, though there wasn’t much chance for this kind of idiosyncratic part leading to a trend that risked running roughshod over rock as a whole. Topping it all off is Dixon himself on piano. Though never held in the same regard as many of his contemporaries, Amos Milburn and Ivory Joe Hunter of those we’ve already come to know so well, Fats Domino, Harry Van Walls and eventually Little Richard down the road a piece, Dixon was hardly just taking up space behind the keyboard. Here his left hand is handling the bass chores for much of the record before taking the second solo with some quirky choppy playing of his own. You almost feel sorry in a way for the headliner, Eddie Williams, whose bass outside of a brief spot in the intro is all but lost in the abyss and since the others all stand out with their abilities highlighted in the arrangement you wonder if the leader of the group felt a little left out. But surely he’d get over any perceived slight when the band as a whole were singled out for their creativity in coming up with something so distinctive to begin with. On the whole this the closest we’ve come to the wonderful work of Johnny Otis that made Joe Swift’s That’s Your Last Boogie so memorable. This is much slower, not quite as busy with fewer moving parts due to having less instruments to work with, but it’s nearly as effective and not surprisingly Dixon’s later solo rendition barely changes a thing about it, as he knew full well how effective it was. But let’s be real about it, no matter how well crafted this may be, in the rock landscape of mid-1949 Blues In Cuba is too “out there” to connect on a wide basis. It’s a record that requires a certain advanced musical sensibility to intuitively grasp and for a form that is still emphasizing flash over subtlety, driving simplicity over clever complexity, all of which are essential to draw notice on a jukebox in a crowded noisy café, or even for a live gig where patrons might be unwilling to sit still long enough to absorb something this mystifying, this probably wasn’t going to cut it. Maybe not in all places for all audiences but in certain pockets more attuned to the distinctive components they’re using this actually DID find some receptive ears to bend. Maybe not surprisingly one of these was New Orleans, which thanks to a number of factors including its close proximity to islands, the influx of immigrants over the years adding to the textures of the Crescent City sounds, and even the back and forth exchange that would later occur thanks to radio broadcasts which reached across the Gulf Of Mexico, the two entities were closer in spirit than might first appear. I don’t know exactly if Blues In Cuba would be accepted IN Cuba, or if it was drawing at all from the musical strains coming out of that region. It doesn’t quite sound as if it were on the surface, but what I do I know about Cuban music of this specific era beyond a few Desi Arnaz recordings? Whatever the source of inspiration there is one thing I DO know and that is, while I fully admit that as a record in June of 1949 this was slightly out of step with rock ‘n’ roll and is not a direction that rock as a whole would want to venture if mass popularity was its ultimate goal, the record itself is no less winsome because of it. 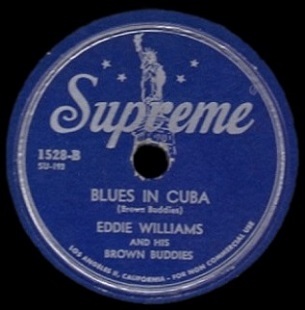 Leave a reply on "Eddie Williams And His Brown Buddies: “Blues In Cuba”"